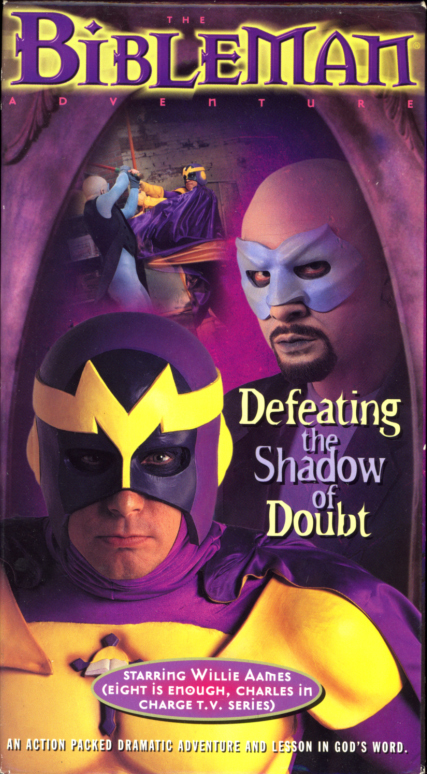 Bibleman: Defeating the Shadow of Doubt on VHS. Starring Willie Aames. Written and directed by Willie Aames. 1998. Miles Peterson was a man who had it all: wealth, status, success. Still, something was lacking. Then, in his darkest hour, the words of a single book gave Miles Peterson the burning desire to know god. Now, transformed by the word of the lord and empowered by his strength, Miles Peterson lives out a pledge to fight evil in the name of god, under the identity of the mighty avenger of truth known as Bibleman. 666 Mark of the Beast on VHS. 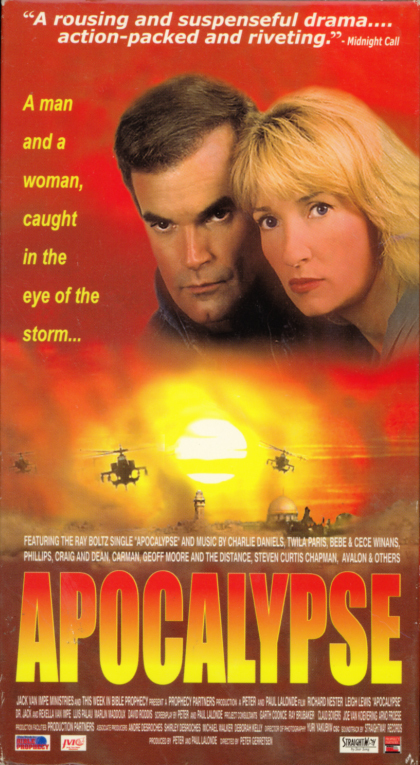 Directed by Anthony J Hilder. 1998. The dynamic documentary serves as irrefutable evidence that the Warlords of Wall Street & Washington have now devised a way to “inject” every individual on the planet with their “MARK OF THE BEAST.” This diabolical plan is being proposed under the guise of offering “great benefits to mankind,” such as 1) doing away with robbery by doing away with cash, 2) offering a National Health Program that would give doctors and their patients a “permanent medical record” affixed on an implanted bio-chip in the back of the right hand, 3) doing away with illegal drugs by doing away with “illegal cash,” and 4) stopping “illegal employment” by identifying all citizens seeking work. Hillary Clinton’s proposed “MANDATORY” vaccination program for all children (before they could enter government-controlled schools) could well be the “covert” vehicle used to justify the injection of the 666 MARK. Far more sophisticated than Adolf Hitler’s “tattooing” of all Gypsies and Jews, Hillary’s proposal, if passed, could nail all citizens with a permanent I.D. number. And any “disease” or “drug” they deem necessary to pacify the public to accept a NEW WORLD ORDER. Hillary and Bill are pushing his program. The Illuminati plan is to have the Social Security number (9 digits) incorporated with the new 9-digit zip code, giving a 6-6-6 eighteen digit Personal Identification Number to all people so that they could be traced, tracked and controlled. Those who “control” the US Space Program have already installed a “GRID SYSTEM” through the NASA satellite program and are now “tracking people and vehicles” from space stations. Unbeknownst to the average American, the U.S. military is already using “transponders” that are injected into the arms of U.S. military personnel. As it was in Hitler’s Germany, so it is in Clinton’s America. H.L. Mencken once said, “One can never underestimate the intelligence of the American people.” But even those with “limited intellect” can determine that “the system” being developed “for them” is not only Satanic, but would, IF ALLOWED TO BE INSTALLED, create a virtual HELL ON EARTH.